When using weather flags and pennants they appear either individually or double. When displayed as a pair, they indicate a more severe weather warning. 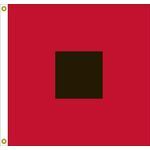 Single Hurricane Flag :	Storm Warning 55 - 73 mph winds. 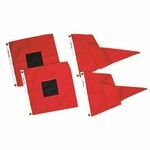 Double Hurricane Flags : Hurricane Warning 74 + mph winds.